If you've been following fashion over the past year; you'll have noticed a stark change in the dynamics of the industry and purposeful blurring of its boundaries by key players, who have managed quite seamlessly to cause an irreversible paradigm shift. Fashion was once seen as an exclusive and essentially impenetrable industry, controlled by a handful of elite albeit old Creative Directors at the top of a pyramid built so high that reaching the top was viewed as unimaginable. It appeals to both the hype starved junkie and the Editor in Chief of Vogue. What Off-White really achieved is the ability to recycle popularity, and utilize it in the process of instigating change. Securing one major collaboration after the other, with brands like Nike, Jimmy Choo, and Moncler. Abloh's upcoming and most hyped collaboration of the year is with IKEA. The Swedish furniture and home accessories hub, known worldwide as the average person's on-the-go furniture haven. In 2017, Balenciaga released their “Arena Extra-Large Shopper” tote bag in blue, priced at over $2000. The internet and fashion critics alike were quick to backlash on the brand, noting the tote's almost identical resemblance to IKEA’s 99-cent “FRAKTA” bag. Why was everyone so riled up? "Is it because fashion has always trolled dominant culture to re-contextualize the most banal of everyday products, albeit with luxurious details?" - Kam Dhillion for Highsnobiety in Style. What Dhillon is trying to say is that fashion has a history of blatantly "borrowing" ideas with no reference or credit given to the source. What's worse is that a lot of the time, the source can be as mundane a thing as a 99-cent IKEA bag. By collaborating with IKEA in such a clear, outspoken and mediatized way, Abloh is sending out another message that cannot be ignored. Fashion is not solitary, it does not stand alone at the top of the pyramid anymore. Youth have become aware of the value of products, everyone has a voice on social media, and everyone now understands the "process" of generating hype and wants to be a part of it; it would be detrimental for any brand to ignore these facts. Off-White is demonstrating how a brand in a modern day social media age can stay relevant by accessing the masses, through smart and well thought out collaborations that showcase humility and forward thinking. 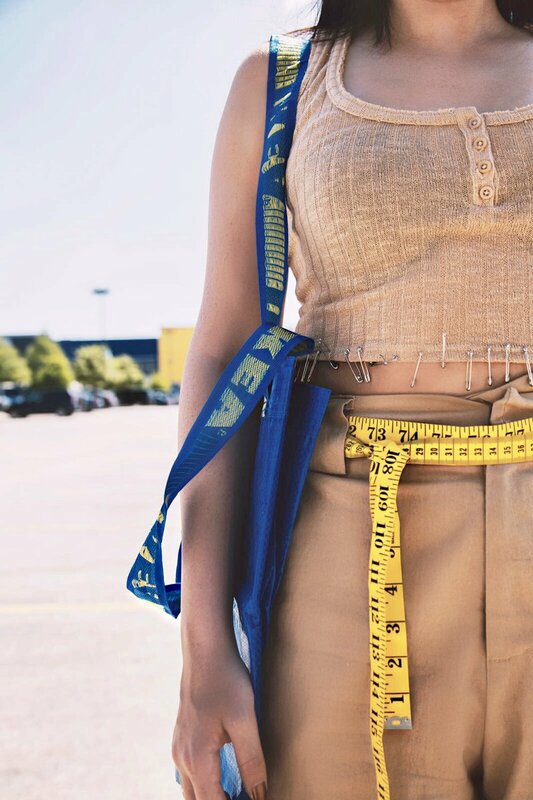 There is nothing more "everyday" than IKEA, and nothing more coveted at the moment in the world of consumerism than an Off-White yellow industrial belt for example - SOLD OUT. Merge the two, and you've effectively penetrated a viewership, consumer base, audience, whatever you want to call it, so large that the brand has transcended being just a "fashion label". 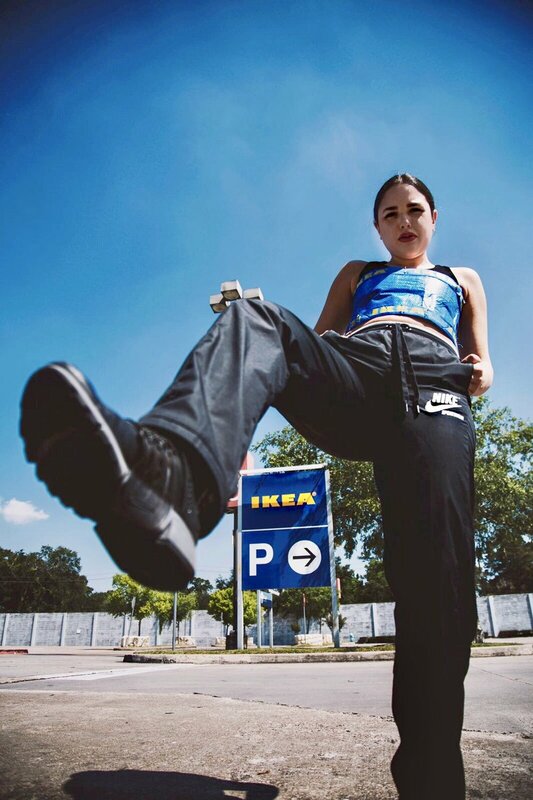 This shoot was inspired by the highly anticipated Off-White x IKEA collaboration, which in essence is a comment on fashion for the 21st Century. Yasmine created a top out of a 99-cent FRAKTA bag she purchased, adding an Off-White belt, I AM GIA pants, and industrial pinning to her look; the archetypal millennial building a life in a hype induced world. Abloh commented earlier this week on a live-stream from an undisclosed location in NY, that his aim is to make an affordable collection for millennials. The designer also promised that the collection will retail at the typical IKEA price points (Mark, 2017, Highsnobiety). On its website, IKEA announced that “together, IKEA and Off-White look for ways to help create a home for millennials who are just starting out their lives (Mark, 2017, Highsnobiety)." You can get a look at this upcoming collaboration in System Magazine's 10th issue entitled, "What is Virgil Abloh? ", launching in November with an in-depth interview with Virgil Abloh and 4 covers featuring this year's most alluring design figure.